Mycobacterium marinum is an atypical Mycobacterium species found in cold or warm, fresh or salted water. M marinum infection occurs following skin and soft-tissue injuries that are exposed to an aquatic environment or marine animals. The infection usually presents as a localized granuloma but can evolve into an ascending lymphangitis that resembles sporotrichosis or can spread to deeper tissues. M marinum is a pathogen classified in Runyon group 1 and is a photochromogen, meaning it produces pigment when cultured and exposed to light. Culture growth occurs over 7-14 days and is optimal at 32°C. See the image below. Photograph of Mycobacterium marinum infection. For additional information on cutaneous M marinum infection, see the Medscape Reference article Dermatologic Manifestations of Mycobacterium Marinum Infection of the Skin. M marinum grows best at 32°C; therefore, cooler extremities, particularly hands, are affected more often than central areas. This feature is also important for optimal growth in the microbiology laboratory. M marinum can disseminate in severely immunosuppressed individuals (eg, transplant recipients). M marinum infections are rare but well described in the literature. The estimated annual incidence is 0.27 cases per 100,000 adult patients. 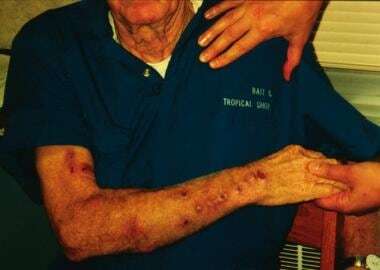 The infection is typically limited to the skin, mostly involving limbs, but spread to deeper structures has been reported. This can result in clinical entities such as tenosynovitis, septic arthritis, and osteomyelitis. Dissemination is extremely rare and has been reported mainly in severely immunocompromised individuals. M marinum is ubiquitous and is found in both salt and fresh waters. At least 150 fish and frog species, aquatic mammals (eg, dolphins), eels, oysters, African toads, and royal pythons are known to acquire natural M marinum infection. In Africa, M marinum has been isolated from healthy human skin and soil. Individuals who fish or work with aquariums are at an increased risk of exposure. To the authors’ knowledge, nosocomial M marinum infection has never been reported. The international incidence and prevalence of M marinum infection are unknown owing to a lack of surveillance. One French study found the incidence of M marinum infection to be 0.04 per 100,000 inhabitants per year. M marinum infection responds slowly to appropriate antibiotic therapy. Infected patients may require treatment for 2 weeks or up to 18 months. M marinum infection may result in persistent ulceration, draining sinuses, or septic arthritis. Aggressive M marinum infection may cause extensive osteomyelitis, resulting in amputation of the involved digit. Disseminated M marinum infection and more invasive skin infections have been reported in significantly immunosuppressed individuals. Reports describe dissemination to the bone marrow and visceral involvement; however, the reports do not include deaths directly related to M marinum infection. M marinum infection has no known racial predilection. M marinum infection has no known sexual predilection. Infection in men is typically linked to occupational exposures. M marinum infection has no known age predilection. Slany M, Jezek P, Fiserova V, Bodnarova M, Stork J, Havelkova M, et al. Mycobacterium marinum infections in humans and tracing of its possible environmental sources. Can J Microbiol. 2011 Dec 19. [Medline]. Feng Y, Xu H, Wang H, Zhang C, Zong W, Wu Q. Outbreak of a cutaneous Mycobacterium marinum infection in Jiangsu Haian, China. Diagn Microbiol Infect Dis. 2011 Nov. 71(3):267-72. [Medline]. Dodiuk-Gad R, Dyachenko P, Ziv M, Shani-Adir A, Oren Y, Mendelovici S, et al. Nontuberculous mycobacterial infections of the skin: A retrospective study of 25 cases. J Am Acad Dermatol. 2007 Sep. 57(3):413-20. [Medline]. Barr KL, Lowe L, Su LD. Mycobacterium marinum infection simulating interstitial granuloma annulare: a report of two cases. Am J Dermatopathol. 2003 Apr. 25(2):148-51. [Medline]. Dolenc-Voljc M, Zolnir-Dovc M. Delayed diagnosis of Mycobacterium marinum infection: A case report and review of the literature. Acta Dermatovenerol Alp Pannonica Adriat. 2010. 19(2):35-9. [Medline]. Van Herendael BH, Dreessen P, Jeurissen A. Fishy Business: the Value of the QuantiFERON-TB Test in the Diagnosis of Mycobacterium marinum Skin Lesions. Clinical Microbiology Newsletter. June 2012. 34 (12):98–100. Safdar N, Abad CL, Kaul DR, Saint S. Clinical problem-solving. Skin deep. N Engl J Med. 2012 Apr 5. 366(14):1336-40. [Medline]. Streit M, Böhlen LM, Hunziker T, Zimmerli S, Tscharner GG, Nievergelt H, et al. Disseminated Mycobacterium marinum infection with extensive cutaneous eruption and bacteremia in an immunocompromised patient. Eur J Dermatol. 2006 Jan-Feb. 16(1):79-83. [Medline]. Tsai HC, Lee SS, Wann SR, Chen YS, Liu YW, Liu YC. Mycobacterium marinum tenosynovitis: three case reports and review of the literature. Jpn J Infect Dis. 2006 Oct. 59(5):337-40. [Medline]. Parrish N, Luethke R, Dionne K, Carroll K, Riedel S. Case of Mycobacterium marinum infection with unusual patterns of susceptibility to commonly used antibiotics. J Clin Microbiol. 2011 May. 49(5):2056-8. [Medline]. [Full Text]. Awais A, Tam CS, Kontoyiannis D, et al. Rapid resolution of Mycobacterium marinum chronic skin infection during lenalidomide therapy for chronic lymphocytic leukemia. Clin Infect Dis. 2008 Apr 1. 46(7):e69-71. [Medline]. Jernigan JA, Farr BM. Incubation period and sources of exposure for cutaneous Mycobacterium marinum infection: case report and review of the literature. Clin Infect Dis. 2000 Aug. 31(2):439-43. [Medline]. Kishihara Y, Nakashima K, Nukina H, et al. [Two cases of acquired immunodeficiency syndrome with disseminated non-tuberculous mycobacterial infection]. Kansenshogaku Zasshi. 1993 Dec. 67(12):1223-7. [Medline]. Rallis E, Koumantaki-Mathioudaki E, Frangoulis E, Chatziolou E, Katsambas A. Severe sporotrichoid fish tank granuloma following infliximab therapy. Am J Clin Dermatol. 2007. 8(6):385-8. [Medline]. Bouricha M, Castan B, Duchene-Parisi E, Drancourt M. Mycobacterium marinum infection following contact with reptiles: vivarium granuloma. Int J Infect Dis. 2014 Apr. 21:17-8. [Medline]. Phan TA, Relic J. Sporotrichoid Mycobacterium marinum infection of the face following a cat scratch. Australas J Dermatol. 2010 Feb. 51(1):45-8. [Medline]. Adhikesavan LG, Harrington TM. Local and disseminated infections caused by Mycobacterium marinum: an unusual cause of subcutaneous nodules. J Clin Rheumatol. 2008 Jun. 14(3):156-60. [Medline]. Aubry A, Chosidow O, Caumes E, et al. Sixty-three cases of Mycobacterium marinum infection: clinical features, treatment, and antibiotic susceptibility of causative isolates. Arch Intern Med. 2002 Aug 12-26. 162(15):1746-52. [Medline]. Barton A, Bernstein RM, Struthers JK, et al. Mycobacterium marinum infection causing septic arthritis and osteomyelitis. Br J Rheumatol. 1997 Nov. 36(11):1207-9. [Medline]. Bartralot R, Garcia-Patos V, Sitjas D, et al. Clinical patterns of cutaneous nontuberculous mycobacterial infections. Br J Dermatol. 2005 Apr. 152(4):727-34. [Medline]. Bråbäck M, Riesbeck K, Forsgren A. Susceptibilities of Mycobacterium marinum to gatifloxacin, gemifloxacin, levofloxacin, linezolid, moxifloxacin, telithromycin, and quinupristin-dalfopristin (Synercid) compared to its susceptibilities to reference macrolides and quinolones. Antimicrob Agents Chemother. 2002 Apr. 46(4):1114-6. [Medline]. Edelstein H. Mycobacterium marinum skin infections. Report of 31 cases and review of the literature. Arch Intern Med. 1994 Jun 27. 154(12):1359-64. [Medline]. El-Etr SH, Subbian S, Cirillo SL, et al. Identification of two Mycobacterium marinum loci that affect interactions with macrophages. Infect Immun. 2004 Dec. 72(12):6902-13. [Medline]. Ena P, Sechi LA, Saccabusi S, et al. Rapid identification of cutaneous infections by nontubercular mycobacteria by polymerase chain reaction-restriction analysis length polymorphism of the hsp65 gene. Int J Dermatol. 2001 Aug. 40(8):495-9. [Medline]. Enzensberger R, Hunfeld KP, Elshorst-Schmidt T, et al. Disseminated cutaneous Mycobacterium marinum infection in a patient with non-Hodgkin's lymphoma. Infection. 2002 Dec. 30(6):393-5. [Medline]. Farooqui MA, Berenson C, Lohr JW. Mycobacterium marinum infection in a renal transplant recipient. Transplantation. 1999 Jun 15. 67(11):1495-6. [Medline]. Forsgren A. Antibiotic susceptibility of Mycobacterium marinum. Scand J Infect Dis. 1993. 25(6):779-82. [Medline]. Galdiero M, Finamore E, Galdiero E, et al. A case of granulomatous skin lesions caused by Mycobacterium marinum in the Campania region. New Microbiol. 2005 Jan. 28(1):89-92. [Medline]. Griffith DE, Aksamit T, Brown-Elliott BA, et al. An official ATS/IDSA statement: diagnosis, treatment, and prevention of nontuberculous mycobacterial diseases. Am J Respir Crit Care Med. 2007 Feb 15. 175(4):367-416. [Medline]. Harth M, Ralph ED, Faraawi R. Septic arthritis due to Mycobacterium marinum. J Rheumatol. 1994 May. 21(5):957-60. [Medline]. Hartmark-Hill JR, Kanodia AK, Frey KA. 53-year-old man with a swollen finger. Mayo Clin Proc. 2008 Feb. 83(2):217-20. [Medline]. Horowitz EA, Sanders WE. Other Mycobacterium Species. Mandell G, Bennett J, Dolin R, eds. Principles and Practice of Infectious Diseases. 4th ed. New York, NY: Churchill Livingstone; 1995. 2264-73. Iijima S, Saito J, Otsuka F. Mycobacterium marinum skin infection successfully treated with levofloxacin. Arch Dermatol. 1997 Aug. 133(8):947-9. [Medline]. Johnston JM, Izumi AK. Cutaneous Mycobacterium marinum infection ("swimming pool granuloma"). Clin Dermatol. 1987 Jul-Sep. 5(3):68-75. [Medline]. Kostman JR, DiNubile MJ. Nodular lymphangitis: a distinctive but often unrecognized syndrome. Ann Intern Med. 1993 Jun 1. 118(11):883-8. [Medline]. Lewis FM, Marsh BJ, von Reyn CF. Fish tank exposure and cutaneous infections due to Mycobacterium marinum: tuberculin skin testing, treatment, and prevention. Clin Infect Dis. 2003 Aug 1. 37(3):390-7. [Medline]. Nguyen C. Images in clinical medicine. Mycobacterium marinum. N Engl J Med. 2004 Feb 26. 350(9):e8. [Medline]. Petrini B. Mycobacterium marinum: ubiquitous agent of waterborne granulomatous skin infections. Eur J Clin Microbiol Infect Dis. 2006 Oct. 25(10):609-13. [Medline]. Ramakrishnan L. Images in clinical medicine. Mycobacterium marinum infection of the hand. N Engl J Med. 1997 Aug 28. 337(9):612. [Medline]. Rhomberg PR, Jones RN. In vitro activity of 11 antimicrobial agents, including gatifloxacin and GAR936, tested against clinical isolates of Mycobacterium marinum. Diagn Microbiol Infect Dis. 2002 Feb. 42(2):145-7. [Medline]. Roddy K, Kao G, Dawn M, et al. The arthritic fisherman. Am J Med. 2008 Apr. 121(4):287-9. [Medline]. Ryan JM, Bryant GD. Fish tank granuloma--a frequently misdiagnosed infection of the upper limb. J Accid Emerg Med. 1997 Nov. 14(6):398-400. [Medline]. Saadatmand B, Poulton JK, Kauffman CL. Mycobacterium marinum with associated bursitis. J Cutan Med Surg. 1999 Apr. 3(4):218-20. [Medline]. Shih JY, Hsueh PR, Chang YL, et al. Osteomyelitis and tenosynovitis due to Mycobacterium marinum in a fish dealer. J Formos Med Assoc. 1997 Nov. 96(11):913-6. [Medline]. Sokol DK, Azzarelli B, Smith RR, et al. Primary intravascular lymphomatosis associated with Mycobacterium marinum. J Neuroimaging. 1998 Jan. 8(1):47-9. [Medline]. Tan HH, Chan RK. Atypical mycobacterium infection with sporotrichoid spread in a patient with human immunodeficiency virus. Ann Acad Med Singapore. 1999 Nov. 28(6):846-8. [Medline]. Vazquez JA, Sobel JD. A case of disseminated Mycobacterium marinum infection in an immunocompetent patient. Eur J Clin Microbiol Infect Dis. 1992 Oct. 11(10):908-11. [Medline]. Weitzul S, Eichhorn PJ, Pandya AG. Nontuberculous mycobacterial infections of the skin. Dermatol Clin. 2000 Apr. 18(2):359-77, xi-xii. [Medline]. Wendt JR, Lamm RC, Altman DI, et al. An unusually aggressive Mycobacterium marinum hand infection. J Hand Surg [Am]. 1986 Sep. 11(5):753-5. [Medline].